A New York professional construction company. General Home Improvement Contractors - New York State. We offer a customer service satisfaction guarantee policy and if you aren't satisfied 100% you could get a full 100% money back refund because we are confident that we will do the job right. We are fully licensed. 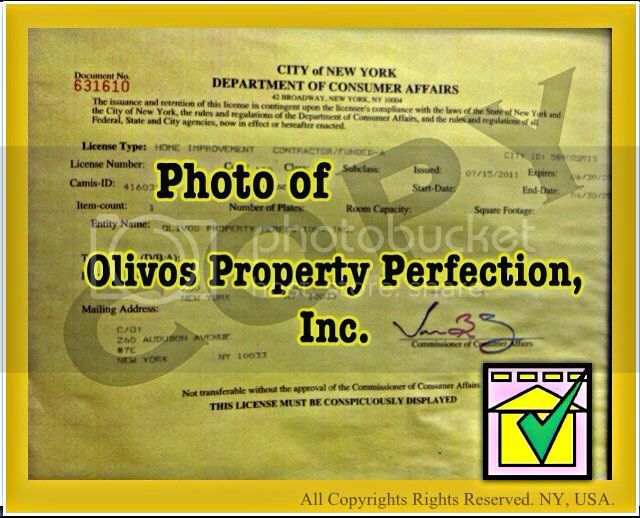 Olivos Property Perfection, Inc. is listed in the New York Government database for Home Improvement contractors. Our rates are affordable to continue to make our clients happy and keep them happy for many more years to come. You have the right to cancel any contract within three days of the contract date. Remodel, Renovate, and or demolish. Locks / Floors / Replacements / Expansions / Cleaning services / Demolish work / and more. You can call us and or email us at anytime. Fire Guards / Fire Safety Directors from Olivos Property Perfection, Inc. are suppose to be always alert and prepared for any type of fire danger. Olivos Property Perfection, Inc. fire guards are experienced, certified and graduated from certified schools. Fore more information about Certificate of Fitness you may click on here. Every job/project we begin will be up to building codes acceptance, we follow it and your terms. We know that you want the best for your property, its a obvious thought. Here, at Olivos Property Perfection, Inc. we have licensed Real Estate agents that knows how the market is out there. If you let us improve your property, not only will it look better, have a greater chance of a higher appraisal, better architect designs, barge board at a supreme level, and a more reasonable and affordable contract which will provide safety. When should the person you hire have a Home Improvement Contractor License? 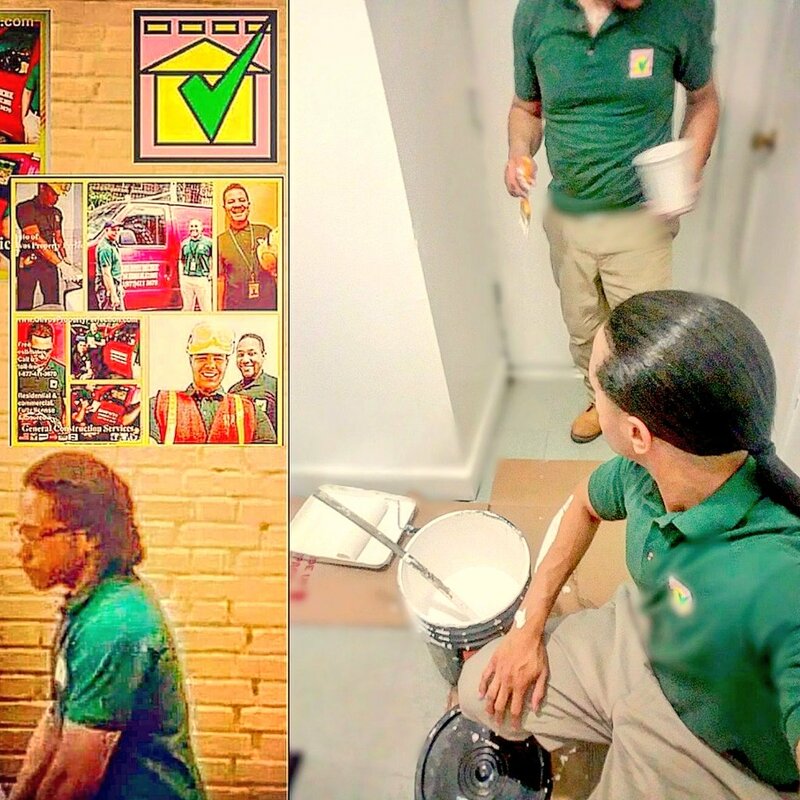 According to the law and by the DCA, any person and or business that solicits, canvasses, sells, performs, or obtains home improvement work that costs more than $200 (two hundred dollars) must have a license. In order to operate legally in New York. Any home improvement work can be any type of remodeling or repair including: awnings, basements, central heating/air conditioning, cabinet installations and or removals, central vacuum cleaning system, communications systems, drive-ways, fences, garages, entire floor remodeling and or removals, large and or small patios, porches, roofing, sidewalks, storm windows, swimming pools and or Jacuzzi installations related work, also terrace work. Landscaping is also considered home improvement, with proper planting and installation of lawn sprinklers. Therefore, please make sure that your contractor is licensed. Contractors that are licensed undergo a criminal background check, a person and or business cannot be issued a licensed if they have a felony in the criminal background. Please note that the prices you see below are not exact as it may vary. The prices you see below may be more or less than your actual price. The costs below is just to give you an idea of what you may expect. Olivos Property Perfection, Inc. gives some of the lowest prices at quality work. For the most accurate price, we may need to visit the property to measure and find the materials. We try to provide you quality at affordable prices. Room Addition, Division, Private home with a door (average size): PRICE: $90 - $190 per square foot. For a single room, little to none electric work, typical finishes, regular paint, easy to tie in with existing home, tie in with heating / cooling system and normal space size. Co-Op / Condo Remodeling, Renovate work (average size): PRICE: $90 - $275 per square foot. For complete interior apartment work, including any doors, base moldings, wood flooring, partial to complete painting, wallpaper, framing, skim light coating, partial to complete kitchens, bathrooms, plumbing, electrical work, stone and or tile, custom wood / hardwood floors work, and custom cabinets. For a entire bedroom painted, two coats, wall tape, and duck tape for covers on a residential area. Usually will take about 1 day to complete work listed on the contract. Turn your room into a better appearing place by painting it by professionals. "Awesome work and great price. Thank you olivos property perfection." - Comment added by Mary M. from NY, NY. "I didn't know which company to choose because there were so many. I let my kids pick, they know research better than me. They found olivos property perfection and I was like ok. Everything was perfect." - Comment added by Richard W. from Brooklyn, New York. "I didn't want to get ripped off. I waited a long time until I saw that olivos property perfection was the cheapest." - Comment added by Paul R. from Bronx, New York. "Excellent" - Comment added by William S. from Staten Island, New York. "If I have to say something about the work to a friend, it would be that I never had to rush them. They are fast." - Comment added by Shawn B. from Harlem, New York. "Me encanta la forma en que mi casa se veia antes, pero despues fue fantastico. Gracias olivos" - Comment added by Jennifer G. from NY, NY. A percentage of Olivos Property Perfection, Inc.'s profit goes to the medical field such as to fights for a cure to Cancer/HIV and/or other charities. We appreciate your business. If anyone is interested in joining Infinity Downline, click here. 2018 All Rights Reserved. | Olivos Property Perfection, Inc.